Galletta says that many anglers overlook the killer terrestrial fishing on the Bighorn. Have you dreamed of fishing the famed Bighorn River in Montana? If you’re not from Big Sky country, traveling there to fish can be intimidating. How do you know what to expect the. . . Welcome to our latest edition of the Orvis News Friday Fly-Fishing Film Festival, in which we scour the Web for the best fly-fishing videos available. This week’s collection features 13 videos (second prime number in a row!) from around the world, with a couple super-shorties that show how to. . .
Brodie with actress Zsófia Psotta in White God. See it in theaters March 27th, 2015. Folks who have seen the new move White God come away very impressed by the performance of Brodie, the dog who plays the character of Hagen. In the film, Hagen is taken from his. . .
As you can see, there were also plenty of men there to support the showcase and its goals. With the success of last year’s Women’s Fly Fishing Round Table, The Fly Fishing Show sponsored a weekend-long Women’s Fly Fishing Showcase not far from the expo’s main floor in Somerset, . . .
Bailey poses with her grateful family. Danielle Davenport, an 11-year-old girl from Wentzville, Missouri, had never had a seizure before, so when it happened in the middle of the night, there was no one there to help. But the family. . . These killer new beads are both heavy and realistic-looking. Do you really need realistic beads to tie effective nymphs for trout? Of course not. Will you want some of these? Probably. Fly tying is about a lot more than just creating flies to catch. . . Welcome to another edition of our trivia challenge, where we test your knowledge of all things fly fishing and where you might learn a thing or two about this sport we love. This one features. . .
As part of the “Go Further/Every Day Heroes” series, Ford has released a great video featuring First Sergeant Ira Strouse (Ret.) and his work with Project Healing Waters Fly Fishing, . . .
Richard Brower and his German Shepherd, Dozer, reunited again. 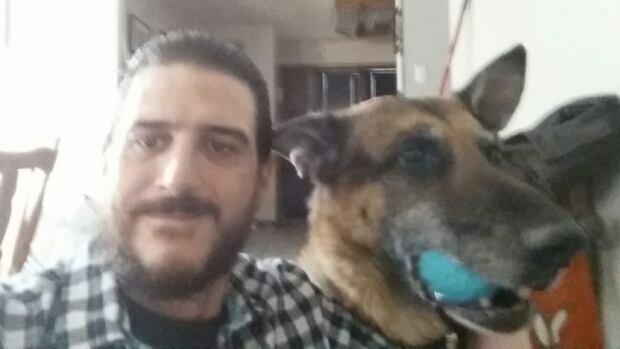 When Richard Brower’s beloved German Shepherd, Dozer, disappeared from the backyard a year and a half ago, the Alberta man was “devastated.” It took him 18 months to accept that Dozer. . .
Harry the Dirty Dog was a cautionary tale about judging by appearances. As I wrote back in December (in a post featuring a video of Betty White reading Harry the Dirty Dog), I am a big fan of the books written by Gene Zion and illustrated by Margaret Bloy. . .